Lord of Winterfell and Warden of the North, Eddard Stark is King Robert’s oldest and greatest friend. Raised together as wards of Lord Arryn, they were going to become brothers when his father Lord Rickard Stark agreed to wed Lyanna, Eddard’s sister, to the young Lord Robert. But Lyanna was stolen away by Prince Rhaegar, and Lord Rickard and his heir Brandon were murdered by the Mad King. Eddard became Lord of Winterfell, and with Robert and Lord Arryn led a rebellion that brought about the end of House Targaryen. 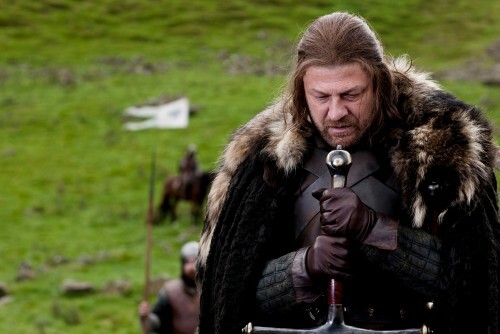 A great commander and a dangerous warrior in his own right, Eddard Stark is perhaps best known for his sense of honor and duty; when Robert was willing to condone the murders of Prince Rhaegar’s infant children, Eddard was driven apart from him until the two were reunited in the grief following Lyanna’s lonely death. Since the rebellion, Lord Eddard has largely kept to the North, only seeing the man he helped to the throne when he called his banners to join him in putting down Lord Greyjoy’s rebellion on the Iron Islands. Eddard is a great lord of the realm, and has the Stark look with his brown hair. Eddard Stark has been aged 5 years for Game of Thrones. While he is certainly a skilled commander in the series, his skill as a swordsman are much more modest than they appear to be presented as in the show. His negative view of tourneys in the novels had more to do with not turning war into a game, as opposed to reports of the pilot presenting it as his preferring to keep possible opponents unaware of the full extent of his abilities.